All transactions are safe and secure with a reliable history in online purchasing behind each of our associates. 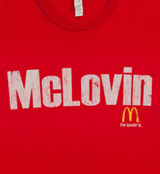 Buy the Superbad McLovin McDonald's t-shirt to own Superbad clothing and merchandise. This McLovin McDonald's style tee lets everybody know that you're from the islands. Match it with the popular Iron Chef Superbad t-shirt that displays Seth's funny Iron Chef Superbad quote on the front. The quote is heard when Seth is bragging about his future sexual reputation at college, "By the time college rolls around I'll be like the Iron Chef of pounding..." Please note that this Superbad merchandise item will not help to score you beer. In addition to the Superbad McLovin McDonald's tee above, browse the Superbad Clothing Gallery for more apparel like men's and women's clothes, kids shirts or hoodies.